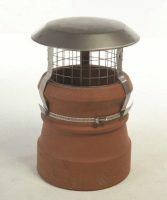 This is the most popular anti downdraught cowl in our range. Since its launch in 2006 we have seen this cowl become dominant in the market place. NOT Suitable for Smokeless Fuels! 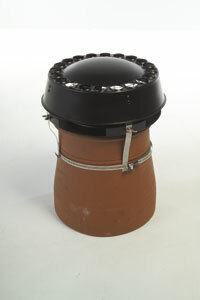 Please see the stainless steel version for smokeless fuel burning or coastal areas. Click Here for stainless steel version. The reason its so popular is that its compact and aerodynamic shape allows it to combat downdraught, whilst only the highest quality materials are used allowing longevity of use at very competitive prices, however these materials are not suitable for smokeless fuels. 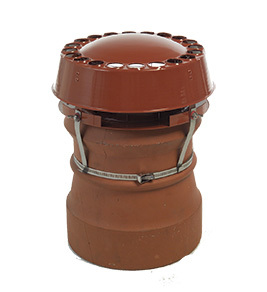 The static cowl in painted form can be used with all fuels and has a test certificate to BSEN 1856 1:2003 and BSEN 1443:2003 and as with all MAD cowls that have a test certificate, the only materials used are those stipulated in the test certificate. 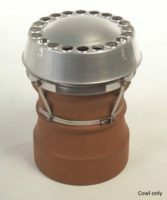 Top Cap Says: This cowl is for standard chimney pots, its most common uses is for diverting excessive wind in the chimney and reduces howling to minimum, and eliminates updraught and downdraught to the bear minimum with interfering with the natural draw of the chimney. The cowl is also certified safe for gas appliances.. Tip 1: Black is recommended for open fires and stoves, as the terracotta quickly becomes dirty and over a period of weathering degrades quickly, the black remains cleaner looking for longer. Tip 2: Spraying the cowl in W40 for coastal areas may help slow down coastal erosion. 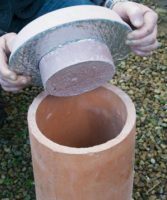 Tip 3: Fits pots up to 12 inches. 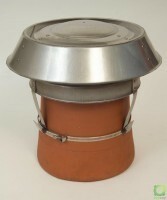 Top Cap Says: This cowl is for standard chimney pots, its most common uses is for diverting excessive wind in the chimney and reduces howling to minimum, and eliminates updraught and downdraught to the bear minimum without interfering with the natural draw of the chimney. 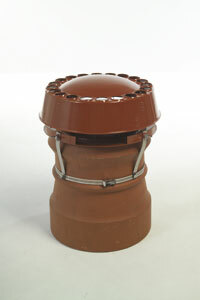 The cowl is also certified safe for gas appliances. Tip 2: Spraying the cowl in WD40 for coastal areas may help slow down coastal erosion.